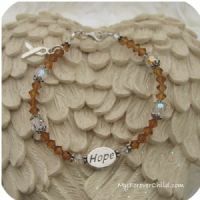 Show your dedication to raising awareness of the special Cause that touches your heart with this beautiful crystal support ribbon bracelet. It makes a very thoughtful gift for an advocate or champion of a particular cause. 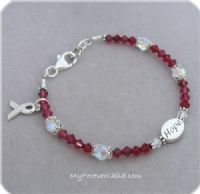 Comes with one sterling silver oval message bead in the saying of your choice. Choose from the list of sayings below. Our quality bracelet is handmade with Swarovski crystals, sterling silver Bali-style beads and findings, sterling lobster claw clasp and a dangling sterling support ribbon charm. Choose your bracelet length below.